#4: What are you eating? Me: Mac & cheese. Spicy mac and cheese! #5: Why do you make everything spicy? I pointed to #4: You’re going to like this someday. #4: Why do you say that? Me: Because you already crossed the line. You like crushed red pepper on your pizza. Me: That’s my point. Crushed red pepper on pizza is the gateway spice. Me: Yeah. You start with a little red pepper on your pizza and pretty soon you’re guzzling bottles of Sriracha and snorting chili powder down in back alleys. Me: This is probably not an age-appropriate conversation, is it? #5: What is wrong with you? Here is quite possibly the best thing to ever come out of the midwest: My stepmom’s recipe for Ro-tel Mac & Cheese. WARNING: Do not attempt to make a “healthy” version of this. It’s pointless and will only piss you off. No soy cheese, no fat-free milk, no gluten-free pasta. Just don’t. If those are your dietary restrictions, just eat the Ro-tel out of the can because it will make you happier. If you send someone under the age of 24 out for a box of elbow macaroni, they will likely return to you with a box of Kraft Mac & Cheese (that’s Kraft Dinner to my Canadian friends). Ro-tel is arbitrarily placed in grocery stores. One of my grocery stores puts it in with the tomatoes, one stocks it with the taco stuff. In case you’ve never heard of it, it’s tomatoes with chilis. Mmm. Spicy. 2. Cook macaroni according to package directions. Drain, rinse and set aside. 3. In a large saucepan over medium heat, heat the 3 cups of milk, butter, salt and pepper until hot but not boiling. 4. In a small bowl, combine 1/4 cup of milk with the cornstarch and stir until dissolved. 5. Slowly add this to the hot milk mixture, stirring constantly with a which. 6. When mixture has thickened, remove from heat and stir in 2 cups of cheese until melted. 7. Pour pasta into a large mixing bowl and add the cheese mixture and Rotel. 8. Mix well until macaroni is coated. 9. Pour into a greased 9×13 baking dish or 3-quart casserole and top with remining cheese. 10. Bake for 35-45 minutes, until golden brown on top. It’s better the second day and perfect as a midnight snack. You’re gonna thank me for this. Posted on April 1, 2014 by JM RandolphPosted in Bad Parenting, YumTagged accidentalstepmom, family, food, JM Randolph, kids, Rotel mac & cheese, spicy mac & cheese, stepmom blog. “Gateway spice” LOL! Fave comfort food: Peanut butter. Straight up, with a spoon. The real stuff. Been hittin’ it since I was fourteen and despite what everyone said some 40+ years ago, I don’t plan to “outgrow” it. I’ll try your mac & cheese version, but with a twist. I married an Italian who, no matter how well disguised won’t touch a chunk of tomato. Blasphemy, I know! So I’ll hit the blender with the Ro-tel before adding. Should I wear a mask? Thanks for sharing! Clearly your husband is unable to visit his mother country because they have put out an APB on him and he’ll be arrested as soon as he hits Italian air space for not liking tomatoes. You may want to just breathe away from the blender, though a mask couldn’t hurt. PS: I love PB too! Milkman loves this idea, and you’re right about the gateway spice. Daughter and Eldest are now fighting over the Frank’s, Joe’s, chicken sauce and Tapatilo on the regular. It’s a gloriously spicy world. Sounds great to me, JM. 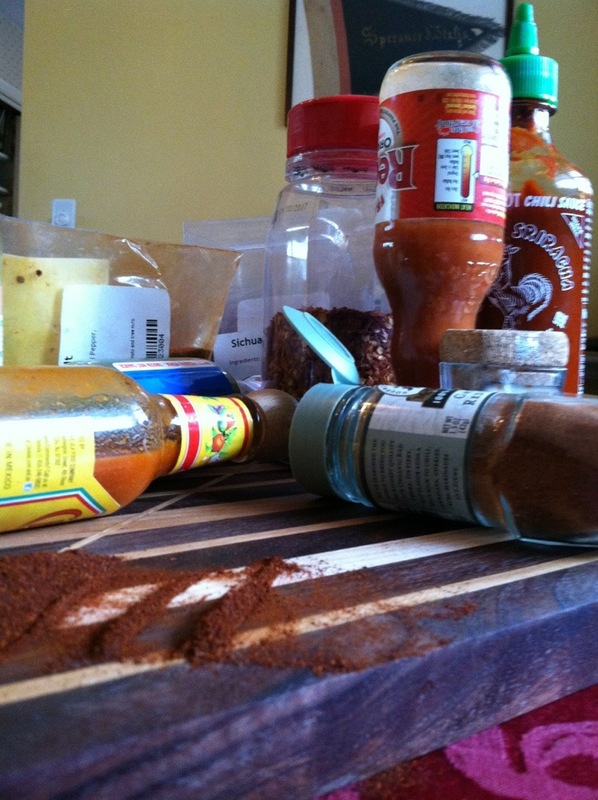 I did start with crushed red pepper on pizza slices. My second step from that gateway was crushed red pepper on hotdogs with sauerkraut and spicy mustard. My father heartily endorsed both moves. Now I enjoy spicy, but have moved on from crushed red pepper on either of those. Hmmmmmm. At least you didn’t explain the origin of “gateway” to them. I’d call that a parenting win! I kind of did. I just left that part out of the post because it makes me look bad. Fail, fail, fail.